How To Dress In Style This Australia Day #Infographic ~ Visualistan '+g+"
Lamingtons, Vegemite, Triple J's Hottest 100 - us Aussies have a lot to be thankful for. 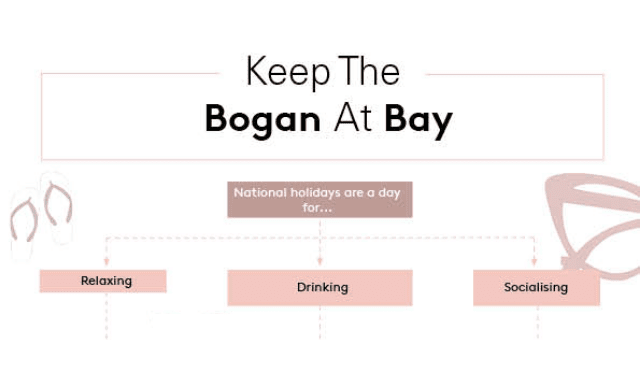 Whatever your opinion is on Australia Day (and we admit, there are many), at the very least it’s a day off from work and we really can’t complain about that. And of all days, today is the day that you don’t have to be afraid to go overboard with the patriotism. Why not whip out that Bingtang singlet, flag bucket hat or even for a milder look, stick with Aussie-themed colors - red, white and blue or yellow and green are both patriotic color schemes. But if you’re really not into channeling your inner bogan this year, we have your what-to-wear needs covered for every occasion. Simply take this flowchart quiz and tackle your style dilemmas with our round-up of the four best ways to spend the day, featuring rooftop pools, boat parties, snags and more.